What is most interesting about this cross is that it was given to the Franciscan friary at Lislaghtin, Co. Kerry, by Cornelius Ó Conchobhair and his wife, Avelina (Eileen), daughter of the Knight of Kerry. It marks a new prominence of high-status women in fifteenth-century Ireland. 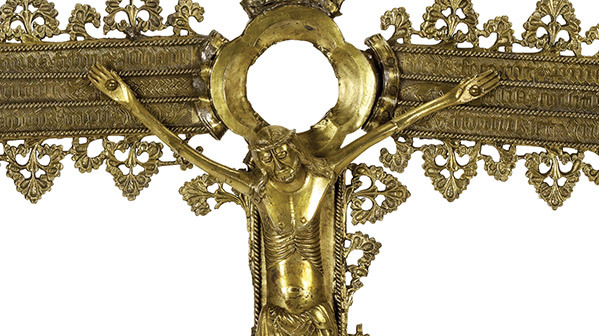 The cross, the finest of its kind from mediaeval Ireland, is of gilt silver. The elongated figure of the crucified Christ was surrounded by the symbols of the four evangelists; that for St Matthew, at the foot of the cross, is now missing. Figures of Franciscan friars decorate the base. It is in late-mediaeval Ireland that high-status women begin to appear as patrons of monasteries and abbeys. The shrines of the Book of Moling and the Stowe Missal record the names of female as well as male patrons. The 1451 obituary of Margaret O’Carroll, daughter of Tadc O’Carroll, lord of part of what is now Tipperary, describes her death as a loss to ‘all the Learned in Ireland’, including ‘both philosophers and poets’. It also has her ‘preparing high-ways and erecting bridges, churches and Mass books’, suggesting that she could deploy considerable financial and organisational resources. Margaret also took part in a large-scale Irish pilgrimage to the shrine of Santiago de Compostela in northern Spain. There is some evidence of women being literate and formally educated in the latefifteenth century, especially in the Anglo-Normancontrolled areas. Six monastic schools on crown lands are mentioned in 1539 as educating ‘both gentilmen childer and other, both of man kynd and women kynd’. It is not clear how long these schools had been established, but their existence suggests that the new humanist idea of giving girls access to formal education had some purchase in Ireland. Within the colony, women could achieve significant status. Townswomen could trade and make contracts on their own behalf. Some Anglo-Irish women managed huge estates while their husbands were away, often for lengthy periods, on military service. Equally, the status of women of the landowning class was somewhat enhanced by provisions for inheritance under English (feudal) law. Under Irish (Brehon) law, women were not allowed to inherit collective property. Feudal law allowed a woman to inherit property if there was no male heir. This created in Ireland a degree of inheritance shopping, with rich families using whichever system suited their circumstances best. Yet, for both the Irish and the Anglo-Irish, marriage seems to have been a moveable feast, and divorce was easily available. It remained normal for upper-class men and women to have a succession of spouses. Dubhchabhlaigh Mór (‘the Great’), daughter of the king of Connacht, who died in 1395, was known as Port-na-dtrí-namhad (‘Meeting place of the three enemies’), because she married in succession three sworn foes. It is interesting that when, after about 1400, the Irish adopted the common European practice of requiring a new wife to bring a dowry, it was with the proviso that the dowry must be returned in the event of a divorce.